This page lists historical novels for young adult readers set in England and the British Isles during the Tudor period and in Italy and Continental Europe during the Renaissance. The Renaissance began in fourteenth century Italy as scholars translated forgotten works of pagan Greek philosophers, leading to a new freedom of thought and a flowering of philosophy, art, science and culture. The Catholic Church was a powerful force, but new religious movements began to question its teachings and practices. 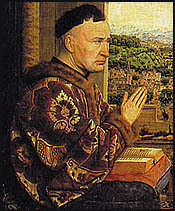 During the German Reformation, reforms urged by Luther and Calvin gave rise to Protestant churches that did not recognize the Pope's authority. In England, Henry VIII adopted Protestantism so he could divorce his wife Catherine of Aragon and marry Anne Boleyn in the hope she would give him a male heir. She didn't and was beheaded after reigning only a few years. 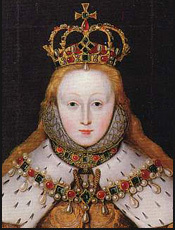 But her daughter Elizabeth became one of England's greatest monarchs. 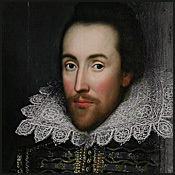 During Elizabeth's reign, Shakespeare wrote plays that are still performed on stage and in film today and enjoyed by millions. Dennis Abrams, I Was Cleopatra (2018), about John Rice, a boy actor who specialized in playing female roles in the time of Shakespeare, when women were not allowed to appear on the stage; Recommended for ages 13-17. Veronica Bennett, Shakespeare’s Apprentice (2007), about an apprentice actor who falls in love with a niece of Lord Essex shortly before Essex is convicted of treason. Recommended for ages 14 and up. Lisa Klein, Ophelia (2006), a retelling of Shakespeare's Hamlet from the perspective of Ophelia. Recommended for ages 12 and up. Carolyn Meyer, Loving Will Shakespeare (2006), historical romance about Anne Hathaway, the childhood friend of Will Shakespeare who later becomes his wife. Recommended for ages 12 and up. Gary Blackwood, The Shakespeare Stealer (1998), about an orphaned boy who is instructed by his master to steal the manuscript of a play from Shakespeare; #1 in the Shakespeare Stealer series. Recommended for ages 8-12. Gary Blackwood, Shakespeare's Spy (2003), about an orphaned boy who is instructed by his master to steal the manuscript of a play from Shakespeare; #3 in the Shakespeare Stealer series. James Hartley, The Invisible Hand (2017), about a boy of the present who is sent to a Scottish boarding school where he discovers he can travel into the past, and a girl who can travel into the future, who both become involved in the story of Shakespeare's Macbeth; #1 in the Shakespeare's Moon series. Recommended for ages 10-13. James Hartley, Cold Fire (2018), about a group of present-day teens involved in the tale of Romeo and Juliet, and Will Shakespeare as a young teacher 400 years in the past; #2 in the Shakespeare's Moon series. Recommended for ages 10-13. Peter Hassinger, Shakespeare's Daughter (2004), about a fourteen-year-old daughter of Shakespeare who dreams of becoming a singer and goes to visit him in London. Recommended for ages 10-14. Anthony Horowitz, The Devil and His Boy (2000), about a thirteen-year-old boy who joins a troupe of actors and then learns they are plotting to overthrow Queen Elizabeth. Recommended for ages 10-12. Rosemary Sutcliff, Brother Dusty-Feet (1952), about an eleven-year-old orphan boy who runs away from his aunt and uncle and joins a troupe of traveling players. Recommended for preteens. Alex Woolf, Assassin's Code (2017), about a girl who works, disguised as a boy, as a theatre stagehand and, while searching for her missing brother, learns of a plot to assassinate Queen Elizabeth; #1 in the Shakespeare Plot series. Recommended for ages 10-13. Alex Woolf, The Dark Forest (2018), about a girl who learns of a plot against James I, the new king, that involves the abduction of William Shakespeare; #2 in the Shakespeare Plot series. Recommended for ages 10-13. Beverley Brenna, Falling for Henry (2011), about a modern-day girl who slips back in time to the early sixteenth century where she finds herself in the body of the young Katherine of Aragon and being courted by Prince Henry, who is not yet King Henry VIII. Recommended for ages 12 and up. Eve Edwards, The Other Countess (2010), historical romance about an eighteen-year-old boy sent to court to find a wealthy bride and the penniless but aristocratic girl he finds himself attracted to; #1 in the Lacey Chronicles series. Recommended for ages 14 and up. Eve Edwards, The Rogue's Princess (2013), historical romance about a Puritan girl who falls in love with a young actor; #3 in the Lacey Chronicles series. Recommended for ages 14 and up. Pauline Francis, Raven Queen (2007), about Lady Jane Grey, who was Queen of England for nine days before being executed for treason. Recommended for ages 12 and up (warning: gory ending). Mary Hooper, At the House of the Magician (2007), about a young woman who becomes a maid for Dr. Dee, the court magician for Queen Elizabeth; #1 in the House of the Magician series. Recommended for ages 12 and up. Mary Hooper, By Royal Command (2008), about a young woman in Dr. Dee's household who is working as a spy for Queen Elizabeth; #2 in the House of the Magician series. Recommended for ages 12 and up. Mary Hooper, The Betrayal (2009), about a young woman who works as a spy for Queen Elizabeth and is in love with the Queen's fool; #3 in the House of the Magician series. Recommended for ages 12 and up. Jacqueline Kolosov, The Red Queen’s Daughter (2007), about an orphaned daughter of Queen Katharine Parr who is given the opportunity to study magic and become a lady-in-waiting to Queen Elizabeth. Recommended for ages 12 and up. Jacqueline Kolosov, A Sweet Disorder (2009), about a sixteen-year-old girl at Queen Elizabeth's court whose skill at sewing and embroidery offer her special opportunities while igniting the jealousy of other ladies. Recommended for ages 12 and up. Alisa Libby, The King’s Rose (2009), about Katherine Howard, who at fifteen becomes the fifth wife of King Henry VIII. Recommended for ages 14 and up. Katherine Longshore, Tarnish (2013), a novel which portrays Anne Boleyn as a new arrival at the court of King Henry VIII who accepts poet Thomas Wyatt's offer to teach her how to become popular. Recommended for ages 12 and up. Carolyn Meyer, Mary, Bloody Mary (1999), about Mary Tudor, the daughter of King Henry VIII, during her teen years; #1 in the Young Royals series. BBYA. Recommended for ages 12 and up. Carolyn Meyer, Beware, Princess Elizabeth (2001), about Princess Elizabeth in her teenage years, as powerful men and women try to prevent her from becoming queen; #2 in the Young Royals series. Recommended for ages 12 and up. Carolyn Meyer, Patience, Princess Catherine (2004), about young Catherine of Aragon, sent as a young teenager from her homeland in Spain to become the wife of Prince Arthur of England; #4 in the Young Royals series. Recommended for ages 12 and up. Carolyn Meyer, The Wild Queen: The Days and Nights of Mary, Queen of Scots (2013), about Mary, Queen of Scots, raised in France but sent home to Scotland at eighteen, where a murder scandal erupts that could cost her the throne; #7 in the Young Royals series (#5 and #6 are about Catherine de' Medici and Marie Antoinette, and are listed elsewhere). Recommended for ages 12 and up. Kate Pennington, Tread Softly (2003), about the young woman who embroiders a cloak for Sir Walter Raleigh to wear on a visit to Queen Elizabeth. Recommended for ages 12 and up. Lucy Worsley, Maid of the King’s Court (2017), about a young heiress who becomes a maid of honor to Anne of Cleves and must learn to distinguish between friend and foe in the dangerous court of Henry VIII. Recommended for ages 12 and up. Lucy Worsley, Lady Mary (2018), about Princess Mary, the daughter of King Henry VIII and Catherine of Aragon, and her struggle for her rights during their divorce and through her father's next two marriages. Recommended for ages 12 and up. Jan Burchett and Sara Vogler, First Blood (2016), about a boy apprenticed to King Henry VIII's spy master, Thomas Cromwell; #1 in the Spy Master series. Recommended for ages 9-11. Jan Burchett and Sara Vogler, Traitor's Game (2016), about an apprentice to King Henry VIII's spymaster, Thomas Cromwell, and his efforts to solve a mystery with the help of his friend, a seamstress; #3 and #4 in the Spy Master series. Recommended for ages 9-11. Jan Burchett and Sara Vogler, Deadly Storm and Fatal Voyage (2017), two novels in one book, about an apprentice spy and his seamstress friend in the court of King Henry VIII; #3 and #4 in the Spy Master series. Recommended for ages 9-11. Jan Burchett and Sara Vogler, The Silent Enemy and The Walk of Death (2018), two novels in one book, about an apprentice spy and his seamstress friend in the court of King Henry VIII; #5 and #6 in the Spy Master series. Recommended for ages 9-11. Ann Rinaldi, The Redheaded Princess (2008), about the Princess Elizabeth from the age of nine until she becomes Queen of England at age twenty-five. Recommended for ages 8-12. Rosemary Sutcliff, The Queen Elizabeth Story (1950), about Queen Elizabeth I of England. Recommended for preteens and up. Jane Resh Thomas, The Counterfeit Princess (2005), about a fifteen-year-old girl who becomes a spy for Princess Elizabeth. Recommended for ages 10-14. Jane Yolen and Robert J. Harris, The Queen’s Own Fool: A Novel of Mary, Queen of Scots (2000), about a girl jester whose honesty makes her valuable to Mary, Queen of Scots. Recommended for ages 10 and up. Michael Cadnum, Peril on the Sea (2009), about a seventeen-year-old boy who sails with an English privateer during the battle against the Spanish Armada. Recommended for ages 12-17. Eileen Kernaghan, The Alchemist's Daughter (2004), historical fantasy about a girl who tries to save her alchemist father from the consequences of a rash promise to produce gold for the Queen. Recommended for ages 12 and up. Laurie Lawlor, Dead Reckoning: A Pirate Voyage with Captain Drake (2005), about a fifteen-year-old boy who discovers Sir Francis Drake is his cousin and is invited to come on his next voyage as his servant. Recommended for ages 10-14. Morgan Llywelyn, Granuaile: Pirate Queen (2006), about Granuaile, a Irishwoman who became a powerful pirate with a fleet of her own ships during the sixteenth century. Recommended for ages 10 and up. May McGoldrick, Tess and the Highlander (2002), historical romance about a young woman stranded on a remote island after her parents deaths, whose life changes when she saves a shipwrecked Scot. Recommended for teens. Scott O'Dell, The Hawk That Dare Not Hunt by Day (1975), about a young man who helps William Tyndale smuggle copies of an English-language Bible into England. Recommended for ages 12-15. Maggie Prince, Raider's Tide (2002), about the sixteen-year-old daughter of a farmer, who decides to nurse an enemy raider back to health after the Scots attack. Recommended for teens. Maggie Prince, North Side of the Tree (2003), about a young Englishwoman who puts her own life in jeopardy when she tries to save a Scot from being hanged; sequel to Raider's Tide. Recommended for teens. Rosemary Sutcliff, The Armourer's House (1951), about a girl who goes to live with her uncle, who makes armour, in London during the reign of Henry VIII. Recommended for ages 10 and up. Patricia C. Wrede, Snow White and Rose Red (1989), historical fantasy about a widow and her two daughters who are herbalists and healers, living in the same neighborhood as the queen's astrologer, Doctor Dee. Recommended for ages 12 and up. Avi, Midnight Magic (1999), about the twelve-year-old apprentice to a magician in fifteenth century Italy and his efforts to help his master find out whether there is a ghost in the castle. Recommended for ages 8-12. Mary Jane Beaufrand, Primavera (2008), about the last daughter of a family competing for power with the Medici family in Renaissance Florence. Recommended for ages 12 and up. Lisa T. Bergren, Waterfall (2010), about two teenage sisters, the daughters of archaeologists, who slip back in time to war-torn sixteenth century Italy; Christian message. Recommended for ages 13-17. Theresa Breslin, The Medici Seal (2008), about a boy who is taken in by Leonardo Da Vinci after the artist's companions save him from drowning while he attempts to escape a murderous brigand. Recommended for ages 12 and up. Theresa Breslin, The Nostradamus Prophecy (2008), about a minstrel's daughter who asks for the help of Nostradamus after his prediction of misfortune for her family comes true. Recommended for ages 12 and up. Theresa Breslin, Prisoner of the Inquisition (2010), about a pampered Spanish girl whose life changes after her mother dies in childbirth and the Inquisition comes to her town. Recommended for ages 12 and up. Susann Cokal, The Kingdom of Little Wounds (2013), about a seamstress in a Scandianavian court who accidentally pricks the queen with her needle, setting off a disease epidemic. Recommended for ages 16 and up. 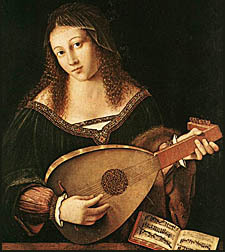 Carol Dines, The Queen's Soprano (2006), about a seventeen-year-old girl in Rome who has a beautiful voice but is not allowed to sing publicly because the pope has forbidden it to women. Recommended for ages 14 and up. Philippa Gregory, Changeling (2012), historical fantasy set in fifteenth-century Italy about a young man cast out of his religious order but recruited into a secret sect that investigates uncanny events, and the young nun accused of witchcraft he is sent to investigate; #1 in the Order of Darkness series. Recommended for ages 14 and up. Philippa Gregory, Stormbringers (2013), historical fantasy about a young monk and a young nun investigating supernatural events amid a dangerous religious crusade and a deadly storm; #2 in the Order of Darkness series. Recommended for ages 14 and up. Philippa Gregory, Fool's Gold (2014), historical fantasy about a young monk and a young nun investigating a coin-counterfeiting scheme which may involve alchemical secrets in Venice during Carnival season; #3 in the Order of Darkness series. Recommended for ages 14 and up. Carol Matas, The Burning Time (1993), about a fifteen-year-old girl in sixteenth-century France whose life changes when her father dies and her mother is accused of witchcraft. Recommended for ages 11-15. Donna Jo Napoli, Daughter of Venice (2002), about a fourteen-year-old girl in Venice who dresses up as a boy in order to explore the city. Recommended for ages 10 and up. Donna Jo Napoli, The Smile (2008), about the girl who thinks she is plain, but inspired Leonardo Da Vinci's famous painting the Mona Lisa. Recommended for ages 12 and up. Barbara Quick, A Golden Web (2010), about a girl in fourteenth-century Italy desperate to escape her stepmother and the marriage plans being made for her, so she can pursue learning instead; based on the life of Alessandra Giliani, the first woman anatomist. Recommended for ages 12 and up. Michele Torrey, To the Edge of the World (2003), about a fourteen-year-old boy who joins the crew of Magellan's ship after his parents die of the plague. Recommended for ages 12 and up. Mary Hoffman, The Falconer’s Knot (2007), a humorous mystery about a love-struck sixteen-year-old in Renaissance Italy who poses as a novice monk to avoid being accused of murder.